Musculoskeletal diseases, especially osteoarthritis (OA) and osteoporosis (OP), impair activities of daily life (ADL) and quality of life (QOL) in the elderly. Although preventive strategies for these diseases are urgently required in an aging society, epidemiological data on these diseases are scant. 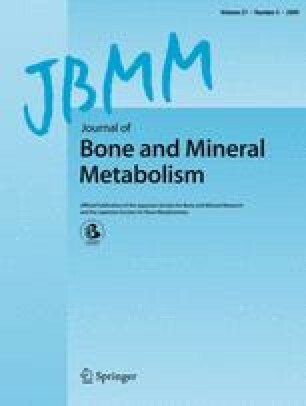 To clarify the prevalence of knee osteoarthritis (KOA), lumbar spondylosis (LS), and osteoporosis (OP) in Japan, and estimate the number of people with these diseases, we started a large-scale population-based cohort study entitled research on osteoarthritis/osteoporosis against disability (ROAD) in 2005. This study involved the collection of clinical information from three cohorts composed of participants located in urban, mountainous, and coastal areas. KOA and LS were radiographically defined as a grade of ≥2 by the Kellgren–Lawrence scale; OP was defined by the criteria of the Japanese Society for Bone and Mineral Research. The 3,040 participants in total were divided into six groups based on their age: ≤39, 40–49, 50–59, 60–69, 70–79, and ≥80 years. The prevalence of KOA in the age groups ≤39, 40–49, 50–59, 60–69, 70–79, and ≥80 years 0, 9.1, 24.3, 35.2, 48.2, and 51.6%, respectively, in men, and the prevalence in women of the same age groups was 3.2, 11.4, 30.3, 57.1, 71.9, and 80.7%, respectively. With respect to the age groups, the prevalence of LS was 14.3, 45.5, 72.9, 74.6, 85.3, and 90.1% in men, and 9.7, 28.6, 41.7, 55.4, 75.1, and 78.2% in women, respectively. Data of the prevalence of OP at the lumbar spine and femoral neck were also obtained. The estimated number of patients with KOA, LS, and L2–L4 and femoral neck OP in Japan was approximately 25, 38, 6.4, and 11 million, respectively. In summary, we estimated the prevalence of OA and OP, and the number of people affected with these diseases in Japan. The ROAD study will elucidate epidemiological evidence concerning determinants of bone and joint disease. This work was supported by Grants-in-Aid for Scientific Research: B20390182 (Noriko Yoshimura), C20591737 (Toru Akune), C20591774 (Shigeyuki Muraki), and Young Scientists A18689031 (Hiroyuki Oka), and Collaborating Research with NSF 08033011-00262 (Director, Noriko Yoshimura) from the Ministry of Education, Culture, Sports, Science and Technology, H17-Men-eki-009 (Director, Kozo Nakamura), H18-Choujyu-037 (Director, Toshitaka Nakamura), and H20-Choujyu-009 (Director, Noriko Yoshimura) from the Ministry of Health, Labour and Welfare in Japan. This study was also supported by grants from the Japan Osteoporosis Society, Nakatomi Foundation (Noriko Yoshimura) and research aid from the Japanese Orthopaedic Association (Director, Hiroshi Kawaguchi). The sponsors had no role in the study design, data collection, data analysis, data interpretation, or writing of the report. The authors thank Mrs. Tomoko Takijiri, Mrs. Kumiko Shinou, and other members in the public office in Hidakagawa Town; and Mrs. Tamako Tsutsumi, Mrs. Kanami Maeda, and other members in the public office in Taiji Town for their assistance in the locating and scheduling of participants for examinations. We also express sincere appreciation to Professors Eric Orwoll and Steven Cummings for their fruitful advice on the establishment of the cohort design and selection of items for the questionnaire.